True Survivor is the official theme song of kickstarter sensation Kung Fury, the upcoming crowd funded martial arts comedy thatâ€™s the brain child of director David Sandberg. If you haven't seen the trailer for that film, it's below as well. It's... well, you'll need to have a strong stomach for nostalgia mashups. 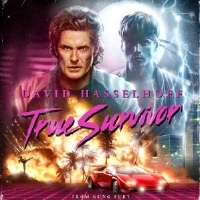 True Survivor is a bang-on 80s throwback reminiscent of end credit theme songs from countless action films of our past. I mean, look at that mullet! That white Lamborghini! Kung Fury is a visually spectacular action comedy. As the story goes, main character Kung Fury plans to go back in time (from the 1980s) to World War II in order to kill Adolf Hitler, known here as Kung Fuhrer and avenge his friends death at the hands of the Nazi leader. An error in the time machine sends him further back to the viking age. With the help of a female Viking and Norse God Thor, Kung Fury continues his time travels in order to put an end to the Third Reich once and for all. ROTFLMAO indeed. Jesus Christ this is awesome!